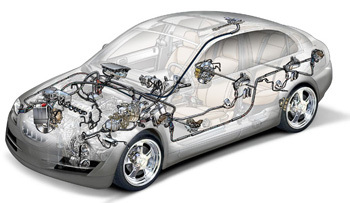 Of all the problems that arise BMW electrical issues can be the most difficult to find and repair. Phoenix BMW drivers may sometimes find it necessary to bring their quality vehicle in to fix a minor component, or for major electrical repair work. Either way, we have the experience and skills necessary to get the job done quickly. BMW Electrical problems can range from the minor annoyance to a safety risk. No matter what kind of issue you are experiencing, our technicians are well versed in what your vehicle will need to be restored to its former performance. BMW electrical repairs often require specially manufactured parts, and will not function properly if the proper parts are not used. Let us use our experience to make sure that your vehicle remains worth being proud of. Because of their status as luxury vehicles, BMW electrical components come equipped with a lot of features that are top of the line at the time manufacture. Extra electronics, navigation systems and digital readouts are beautiful, but require special care to be serviced or replaced properly. Making sure that all of the embedded electronics in your BMW are functioning correctly has a massive impact on your driving pleasure. After all, imported luxury vehicles are equipped with the latest features of their day, and add a style to the vehicle that was carefully designed from the beginning. Furthermore, keeping these features in working order makes your car a pleasure to present; and very fun to drive. Because of the difficulty in obtaining some of the parts, if your vehicle is taken to any old repair shop, you can find the cost of the repair quickly skyrocketing out of control, and the wait to receive the parts to have them installed can feel like a real hassle. As BMW Specialists, we get access to these parts faster than other places, and already know how they fit into the design of the vehicle. As BMW specialists, we are aware that a large amount of BMW problems tend to be electrical in nature. There are a few that definitely need to be monitored for your safety, here are the most important electrical problems that are not uncommon in occurrence. Central Computer Module – the central computer module is what monitors all of the sensors in your vehicle. It also monitors the timing of combustion between cylinders and will alert you if there is an issue present. If this component begins to fail or report erroneously, you can expect to see all manner of issues with your vehicle. Anti-lock Brake System – it doesn’t take very much imagination to see what kind of problems this kind of issue can solve. If you experience any trouble with your brakes, it needs to be addressed and resolved immediately. Smaller parts like. Window motors and windshield wiper motors have been known to exhibit problems in some recent models. These are relatively quick and easy fixes, but these issues have a pretty big impact on the overall feeling of your vehicle. This makes it an issue when considering that it’s the small things that define a luxury vehicle. Don’t let these minor annoyances make an impact on the way you drive, let us handle the small things so you can enjoy driving your vehicle the way it was meant to be; free of all worries and annoyance. We are well versed in what statistically makes these components fail, and how to avoid these kinds of repairs in the future. Let our experience be your ally, take advantage of our expertise and allow us to fix these problems once and for all.